The Shuvu Yisrael sect heavily defended its leader Rabbi Yoshiyahu Pinto on Tuesday, hours after he was convicted for bribery and corruption in the Tel Aviv District Court. 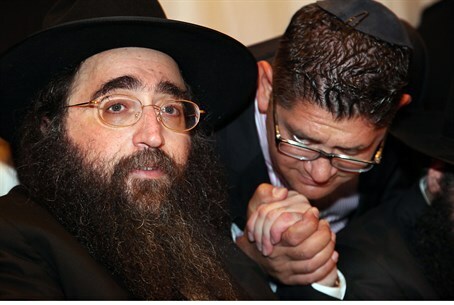 "Our spiritual leader, Rabbi Pinto, appeared in court today with head held high to honor the plea bargain he signed with the government," it said. The sect also insisted that Pinto's sudden heart attack scare Monday, which saw him rushed to Ichilov Hospital but released shortly thereafter, had nothing to do with his legal team's extensive efforts to prevent his extradition for the court appearance. "In contrast to the cynical assessment of the Tel Aviv District Attorney's Office, Pinto came to Israel and his appearance before the hearing was made only after the discharge letter from the Department of Cardiology at Ichilov Hospital was released," it claimed. "Despite his medical condition and the fact that the great man is suffering from a variety of diseases Pinto is still involved in a legal battle regarding the punishment thrust upon him." Despite admitting to involvement in a multitude of corruption scandals, Pinto himself has been highly vocal over his innocence, claiming in hyperbolic statements to his followers that the verdict has "stabbed them with a million knives" and claiming he is "the most persecuted in this generation."